ist genau der richtige Ort, um Ihr Abenteuer auf Big Island zu genießen. In günstiger Lage, nur wenige Minuten vom Flughafen Kona, Costco und Kailua Kona Town entfernt, werden Sie keinen Schlag verpassen. Große Aktivitäten, Strände und Restaurants befinden sich nur 5 - 6 Meilen entfernt. 3 Hektar großes Grundstück. Es ist nicht ungewöhnlich, dass die Temperatur um 15 Grad niedriger ist als die von Kailua Kona. Genießen Sie in der kühleren Jahreszeit die Wärme Ihres eigenen elektrischen Kamins mit einem einfachen Klick der Fernbedienung. Naturliebhaber werden die reichhaltige Vielfalt an Pflanzen und Vögeln in der Umgebung genießen. Kona hat einen großen offenen Markt, der eine Auswahl an exotischem frischem Obst und Gemüse bietet, sowie traditionelle, die lokal angebaut werden und zu einem Bruchteil des Preises, den man in den Lebensmittelgeschäften findet. Für unsere Freunde mit eingeschränkter Mobilität ist das einstöckige Ferienhaus perfekt. Parken Sie vor Ihrer Haustür und betreten Sie die Hütte. Keine Parkplätze oder Parkgebühren. Handtücher, Toilettenpapier, Shampoo / Conditioner, Badegel und Handseife. Plenty of space, and pots for the kitchen. The garden is a very pleasant space to enjoy happy hour. It was nice to get away from the hustle of town. And the owners are very pleasant too. Cottage is one big single room, windows on all sides, for a good cross breeze, more than enough room for us (family of 4, with 2 older kids). Very well kept-up, clean, and thoughtfully appointed with pretty much everything you might need. We ran out of gas for the water heater at one point, and the owners jumped up to fix it right after the call. Also got some nice recs for hiking in the area. Highlight is probably just the sense of seclusion (owner's main house is separate, at a distance) and the restful sound of birds and frogs all around (especially in the morning and after rain) in a very lush, rainforest setting. Chicken and pheasants like to visit the grounds. It's only a 15-minute drive down to Costco and Kona town. Also a quick (15-20 minutes or so) trip from the airport. With regret, we’ve discovered these owners are not to be trusted. This revelation came as a shock; as heretofore we had believed otherwise. In previous stays, the owners had been amenable and helpful. As seniors well into our eighties, access to a holiday rental is important. For the past several years, we have repeatedly used this vacation rental periodically as our base to enjoy the Island. We even looked forward to renting it next year. But not ever again; for the reason this year, we learned of the deviousness and untrustworthiness of the owner. Less than five days before the expiry of our agreed (by telephone) three week tenancy, the owners betrayed us with their announcement that planned reconstruction of their driveway would impede our access to as well as our egress from the rental. This meant in breach of our tenancy agreement, vehicular access would be physically impossible for the last three days of our tenancy. Rather than the owners deceive us in this fashion, had they given us the courtesy of this information five days before our flight to the Island, we could have made alternative rental arrangements. For the short time we were affected, the owners attempted to mitigate the inconvenience their action caused, but made no attempt to abridge the disrespect of the tenancy agreement we’d jointly made in good faith months in advance. Beware! The home is very well stocked with all the things you need to enjoy the island inclusive of kitchen, laundry and beach supplies. 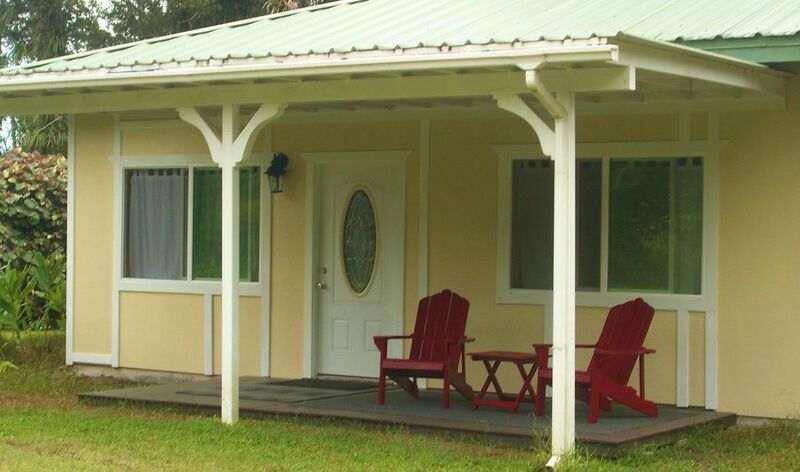 It is a very quiet and peaceful location in a rainforest setting with a 15-20 minute drive to everything you need. The owners checked in on us after our visit and made sure that we have everything that we need. The sounds of night time birds and insects was something that we enjoyed. My daughter also had a great time watching the vists from friendly pheasants every morning. The only minor improvement that I would suggest is to have a dryer installed. Will recommend this to anyone who is interested in taking a relaxing, quiet vacation! Really loved the place. People were very helpful and nice! This was a quiet retreat just 15 minutes from downtown Kona. VERY Spacious inside with all the amenities you could think of! Clean and comfortable! Owners are very accommodating, we appreciated being able to stay a day earlier than scheduled.